Everything IH/Cub Cadet, Farming, Tractor Pulling, college. New 300+HP tractors are useless, if your going to spend the money buy a 4wd. It will do everything the MFWD will do but better. Finally finished up with most of harvest yesterday, still a few little bottom fields here and there. Overall a good fall, good yields and decent weather. Congratulations Jerry! 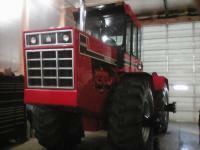 I wish I could find a reason to buy your 7130 but I probably wont be able to come up with one in time! Cast duals? Who runs them? We have them on our 15, with the inside tires full of fluid and the outsides half full it weighs in at 17,800. Used to do all the tillage work with it 10-15 years ago but now we have 4wds so it only gets used on 20-40 acres/year.